Chronicling the international attractions industry (parks, museums, casinos, expos, live spectaculars, 4D theaters, performing arts centers, retail, etc.) in terms of design, technology, media, development, safety and more. By Judith Rubin, top editor, publicist and consultant in themed entertainment. I also write occasionally about topics of St Louis. This article originally appeared in the 2010 TEA Annual And Directory, published by the Themed Entertainment Association. With the authorization of the US Federal government, Nick Winslow and his team are heading up the official USA participation in Shanghai Expo 2010. What that means, exactly, is a complete, soup-to-nuts endeavor, encompassing fundraising, project management, planning, design, production, construction, staffing, operations and, finally, disposal of the building after closing day. Winslow is a seasoned consultant whose experience includes seven years with Warner Bros. Recreation Enterprises and 11 years with Harrison Price Company (now retired, Price was a leading economic analyst whose credits include feasibility studies for many world expo pavilions). In this venture, Winslow and his partner, attorney Ellen Eliasoph, have achieved the near-impossible, and the most impossible task was the first: getting the funds. Most countries that participate in world expos allocate some government funds toward the project. The US does not – a law passed not too many years ago effectively prevents the Fed from making such expenditures. Any group trying to mount a US expo pavilion finds itself in a Catch-22 situation: it's hard to raise the money if you don't have the official nod from the government, and the nod is hard to get if you haven't demonstrated you can get the money. It goes without saying that all this was made doubly difficult by the recession. All members of Winslow's team have been active in sponsorship transactions, notably Norm Elder and Jim Garber in the US, and Felix Wong and Dan Whitaker in China. “It's an event for the ages and I'm glad we're there,” said Winslow. Winslow and Eliasoph persisted and prevailed, aided by significant support and votes of confidence from important voices within the US government, including Secretary of State Hillary Clinton, US Ambassador Elizabeth Frawley Bagley and the Office of Public-Private Partnerships, and Kris Balderston, Clinton's former chief of staff during her Senate years. Winslow's team raced against time and a recession to raise enough of the pavilion's $61 million budget to enable the project to reach the official groundbreaking on July 17. The pavilion's Oct 14 “topping off” ceremony marked completion of its superstructure – placement of the last steel beam. At the ceremony, the U.S. Ambassador to China, Jon Huntsman, and the Deputy Secretary General of Shanghai Municipal Government and Director General of the Shanghai World Expo Coordination Bureau, Hong Hao, joined hands and drew Chinese calligraphy together on a vertical beam of the steel structure. 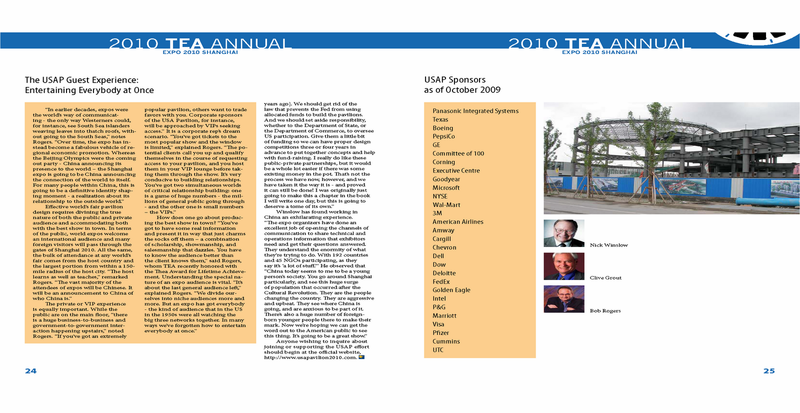 Anyone wishing to inquire about joining or supporting the USAP effort should begin at the official website, http://www.usapavilion2010.com. USA Pavilion architect Clive Grout of Vancouver-based Clive Grout Architect cut his expo teeth working on seven different pavilions at Vancouver Expo 86. Bob Rogers was designer on three of those pavilions. His company, BRC Imagination Arts (Burbank) is designing the exhibits for the USAP. Rogers' career was effectively launched by the work he did in Vancouver, which included the “Spirit Lodge” show at the General Motors Pavilion, and the “Rainbow Wars” film for the British Columbia Pavilion. His company has since designed and produced something like 20 expo pavilions altogether as well as numerous well-known attractions for museums and theme parks, including the Abraham Lincoln Museum in Springfield, Illinois and Shuttle Launch Experience at Kennedy Space Center in Cape Canaveral, Florida. Grout went on to head the firm Architectura, and one of his influential design triumphs with that company was a remarkable expansion of Vancouver International Airport, which, in its configuration, choice of materials and selection of public art, celebrated and evoked the beauty, unique terrain and cultural identity of the region much like a good world's fair pavilion. “We started this with Nick when he was trying to put the USAP together, knowing it was an uphill battle,” says Grout. “It's more than just a job.” Grout has been working very closely with BRC's designers to integrate their requirements for the pavilion guest experience into the show spaces Grout and his associates have roughed out. Grout's pavilion design and BRC's guest experience will develop the expo's “Better Cities, Better Life” theme to envision and celebrate the sustainable cities of the future. The building's entrance and initial queuing area will be Grout's tree-filled “urban courtyard.” The trees will be accompanied by a waterfall, generated by a rainwater-fed pool. The landscaping will reflect the wide variety of climate and terrain in the US. Inside the building, some 2,500 visitors per hour will be pulsed through the multimedia (“4D”) guest experience, which will relate, wordlessly, a story through the sensibilities of a Chinese-American woman living in the year 2030. As the story goes, this protagonist had been a visitor to the Shanghai expo in 2010, and her life as portrayed in 2030 reflects the “Better Cities” catalyst of the expo 20 years earlier – valuing teamwork, celebrating ethnic diversity and marking the accomplishments of the Chinese-American community. Post-show exhibits will portray the seeds of change and sustainability that will help lead the world to the “Better Life” of 2030. How does one go about producing the best show in town? “You've got to have some real information and present it in way that just charms the socks off them – a combination of scholarship, showmanship, and salesmanship that dazzles. You have to know the audience better than the client knows them,” said Rogers, whom TEA recently honored with the Thea Award for Lifetime Achievement. Understanding the special nature of an expo audience is vital. “It's about the last general audience left,” explained Rogers. “We divide ourselves into niche audiences more and more. But an expo has got everybody - the kind of audience that in the US in the 1950s were all watching the big three networks together. In many ways we've forgotten how to entertain everybody at once. Big-screen media experiences have been a hallmark of world expos since Montreal 67, and the latest eye-popping, visitor immersing models will be astounding visitors at Shanghai Expo 2010. World's fairs are a laboratory and international showcase for experimentation on many fronts including architecture, media and entertainment, and without a doubt Shanghai's best innovations will plant seeds in the minds of today's Experience Designers – potent seeds that will grow into concepts for future permanent attractions. The show produced by ECA2 for the State Grid Pavilion, which will feature what are said to be the largest LED screens ever built, could scatter a few such seeds. State Grid is in the business of building and operating electric power grids in China, working toward the goal of establishing a secure, modern and reliable statewide supply. As a global partner of Expo 2010, State Grid will have a pavilion with a multimedia show conceived, designed and produced by ECA2, a French company well known for its media spectacles and productions at world's fairs, Olympics and major sports events, theme parks and mega-celebrations. For 10 hours a day, seven days a week throughout the six months of the expo, visitors will experience Le Voyage de l’Energie, which Pépin has described as an “immersive experience of multimedia art in 720 degrees.” It will use six LED screens to surround the visitor with images of energy in motion. At 350 visitors per four-minute show, ECA2 estimates the pavilion will host a total of some 5 million visitors. Concept designers are Yves Pépin and Sophie Poirier. Artistic director is Moïra Smith and producer is ECA2. Christopher Reyna, New Paradigm Prodns. Jumana Brodersen & The JCo: "You Gotta Believe"
Jeremy Railton and Entertainment Design Corp. The Producers Group: "Everything but the Creative"
Media coverage comes about through the combined efforts of publishers, editors, writers and the companies that make up the industry. It takes an effort, and it takes an investment. Spread the word about your work (i.e. hire a publicist, generate a press release, contact an editor, pitch an article, place an ad, create an online presence) and you will start to get the credit you deserve. Subscribe to Judith Rubin Etc.